ClickMeter enables you to understand which of your marketing channels and ads are bringing in the most traffic. This way, you'll know where to focus your time and money! Assemble your ClickMeter data (and all other digital traffic data you want) into one great dashboard! Create your ClickMeter dashboards today! 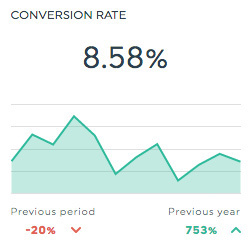 This historic widget shows the percentage of clicks on your ad that led to a conversion (whatever your definition of conversion may be). It is calculated by dividing the number of conversions by the number of clicks, and multiplying the result by 100. 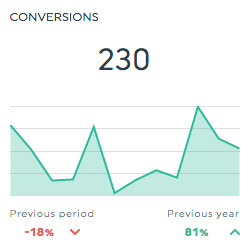 This historic widget shows the total dollar value associated to all conversions, which is calculated by multiplying the value per conversion by the total number of conversions. 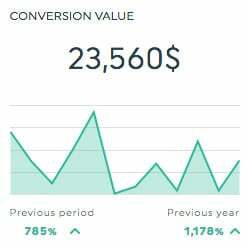 The value per conversion is determined by you when you define your conversion; this is the dollar amount that you consider each conversion is worth to you. 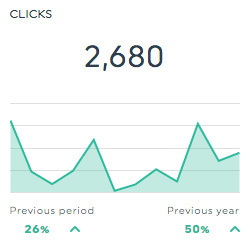 This historic widget shows the total number of times people took a desired action after seeing your ad. This action can be anything from buying a product or service, signing up for a newsletter… it all depends on your objectives. Want to see all our ClickMeter preset widgets? This is the total value of all conversions that can be directly attributed to your ad. Want to see all our ClickMeter metrics, segments, & dimensions? How do I create a dashboard report with ClickMeter?